: A screenshot from the online game "Super Planet Crash," developed by Stefano Meschiari (now a postdoctoral fellow at the University of Texas, Austin) under supervision from Greg Laughlin (an astronomy professor at the University of California Santa Cruz). For those who love Earth-shattering kabooms, a team of astronomers has made just the game for you. "Super Planet Crash" challenges the public to create a planetary system with various kinds of alien planets, ranging from Earth-size planets to gas giants to more massive dwarf stars. If an object crashes into another one before 500 game-years elapse, you lose. While the game is an addictive, points-seeking challenge familiar to lovers of "Angry Birds," it is also powered by an engine used to seek exoplanets in real life. It uses a software package called Systemic Console, a tool to discover planets from the vast amounts of data generated by telescopes. "Systemic Console is open-source software that we've made available for other scientists to use. But we also wanted to create a portal for students and teachers so that anyone can use it," Greg Laughlin, an astronomy professor at the University of California, Santa Cruz, who led the development of the software, said in a statement. With the help of students — principally Stefano Meschiari (now a postdoctoral fellow at the University of Texas, Austin) — Laughlin created Systemic. Meschiari then led the development of a new version, Systemic 2. 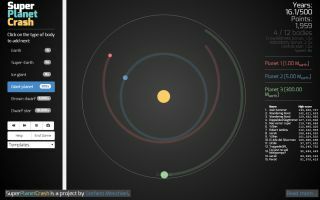 "Stefano tuned the software to make it more accessible, and then he went even further with 'Super Planet Crash,' which makes the ideas behind planetary systems accessible at the most visceral level," Laughlin said. Systemic is designed to combine different kinds of data — even from different telescopes — to search for exoplanets beyond our solar system. Astronomers can find these worlds by watching a star's light dim as a planet passes across its face, or seeing how much a star wobbles due to the gravity of planets circling it. Additionally, the software can figure out how stable the planetary system is and create animations of what the system looks like. To play "Super Planet Crash," visit its website at http://www.stefanom.org/spc/. Systemic Live is available at http://www.stefanom.org/systemic-live/.